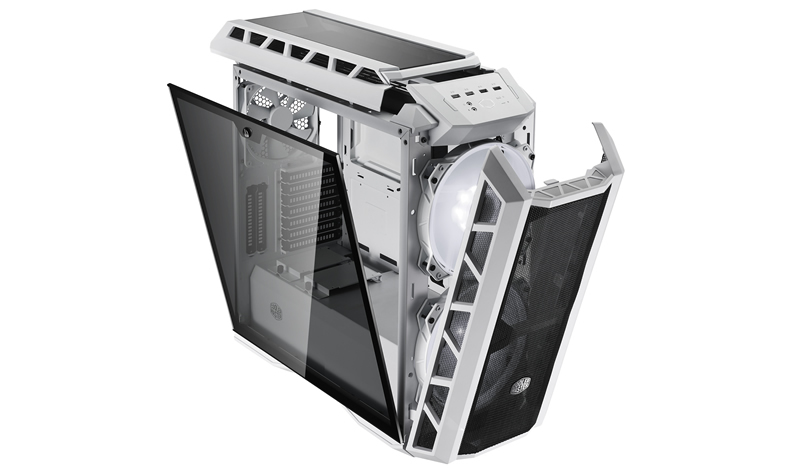 Cooler Master Releases MasterCase H500P Mesh White Today! Shipping today is the new Cooler Master MasterCase H500P Mesh White. The core of the H500P has been available for quite some time but was met with some harsh criticism regarding air flow and panel quality. When we met with Cooler Master at CES this year they were very excited to show that they had taken the feedback and overhauled the H500P. The major changes came in the form of replacing the acrylic front panel with a full mesh screen with a thin filter behind it, adding in a crossbar for rigidity to boot. This change results in a much higher airflow pattern through the case. Related My Top 3 Surprises From CES 2019! Cooler Master, Radeon, and GeForce! The front panel also received a nice clip to keep it from falling off and the top panel got a simple but effective solution using a thumbscrew to keep the top from popping off when shifting or moving the case. The White paint is very uniform and very….very white. Already have the H500P? Don’t worry you’ll be able to pick up just the front panel for that case, matching paint of course. We did get a chance to review the new MasterCase H500P Mesh White in the video included. Be sure to check it out as we had quite a bit to say for the new case. Find the Cooler Master MasterCase H500P Mesh White on Amazon. Cooler Master MasterBox MB511 and MA410M Giveaway With Our YouTube Channel!